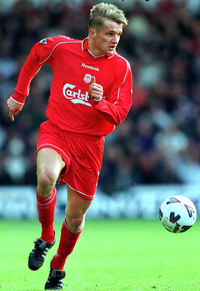 Transferred from Croatia Zagrab to Liverpool on 7/12/2000 for 5,500,000 pounds. Croatian Igor Biscan spent the majority of the 2003/04 season playing in a new position of centre half and he made 39 appearances. A big money signing at 5.5 million from Dinamo Zagreb in 2000 Biscan originally signed as a central midfielder but Houllier felt he was a centre half. However, under Rafael Benitez he feels Biscan's position is central midfield and the Croatian had an outstanding pre-season during the 2004 summer tour of the USA and Canada. It was at the European under-21 Championships in Slovakia, during the summer of 2000, that Liverpool first became aware of Igor Biscan and Gerard Houllier had to beat off competition from Juventus, Barcelona, Ajax and AC Milan to secure his signature. The highly rated Croatia Zagreb midfielder joined the Reds for 5.5 million in December 2000 and he arrived at Anfield with an impressive track record. Despite his young age he was already a regular in the Croatia national side and had captained his club, Croatia Zagreb, in the Champions League and UEFA Cup. Biscan did not have long to wait before pulling on a red shirt for the first time. Just two days after signing he came on as a substitute against Ipswich and, although Liverpool lost 1-0, he made an instant impression, showing neat touches and silky skills. Indeed in the early part of the treble season Igor was excellent in a midfield role during the wins over Manchester United and Arsenal, but despite dominating midfield against the likes of Roy Keane and Patrick Vieira was never seen again in the position and used as a right and left sided midfielder, right back and centre half by Houllier.